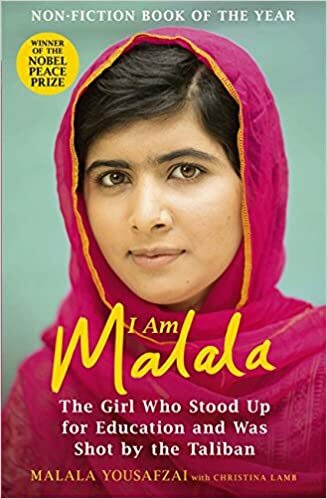 i have been wanting to read this book since it came out because there was quite a bit of press about, firstly, Malala herself and then about her book. But i did not read any book reviews on it so i could just read it without any preconceived ideas. Or so i intended… but it didn´t turn out that way. i went into reading this book with an idea of how it would describe to me her struggle to champion her cause for education in her country and how her getting shot further encouraged her work and others to join her. While the book did cover some of the above, it wasn´t written as i imagined it. i thought it was be written in a clear decisive voice of a young lady, fighting for her beliefs but it was that of a young child with ideals and of a slightly naive girl finding those ideals shuttering around her. And while i was a little frustrated during the time i read it, it made perfect sense once i got more than half way through the book. i needed to hear that child-like voice at the beginning in order to see how truly tragic the situation was in Malala´s home country. i do wonder how she is getting along now, personally and with her cause. i think it does give some insight into the danger involved and the needs of Swat valley and Pakistan. But if you are looking to truly understand the politics or wanting a deep look into the people themselves, i think you might be slightly disappointed. However, if you are in for a story rooted in real life events and in promoting a great cause, this book will deliver. Would i recommend this book? Yes, i would. It does give an idea of what it might mean to fight for what you believe in and how sometimes we, who have been given a good education, do take it for granted… just sometimes. Have you read this book? If yes, would you care to share your comments below? If no, do you intend to read it?